1 Accessible Customer Service Policy Intent This policy is intended to meet the requirements of Accessibility Standards for Customer Service, Ontario Regulation 429/07 under the Accessibility for Ontarians with Disabilities Act, 2005, and applies to the provision of goods and services to the public or other third parties, not to the goods themselves. All goods and services provided by Gillons Insurance Brokers shall follow the principles of dignity, independence, integration and equal opportunity. Scope a) This policy applies to the provision of goods and services at premises owned and operated by Gillons Insurance Brokers. 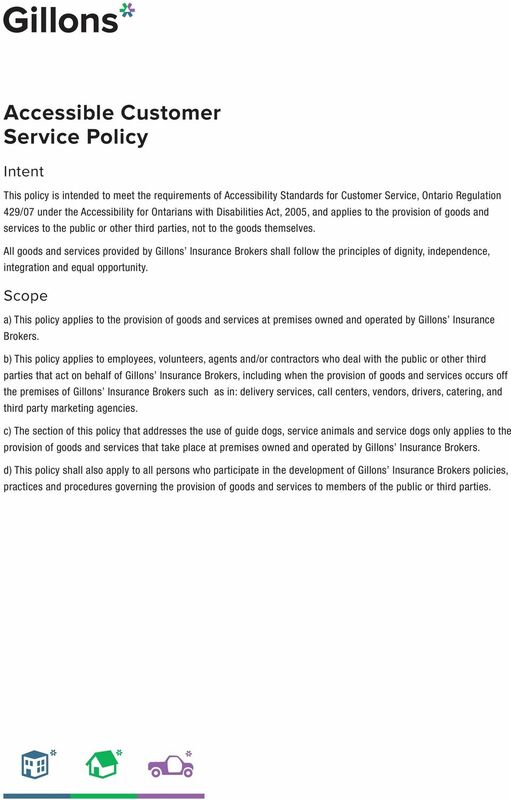 b) This policy applies to employees, volunteers, agents and/or contractors who deal with the public or other third parties that act on behalf of Gillons Insurance Brokers, including when the provision of goods and services occurs off the premises of Gillons Insurance Brokers such as in: delivery services, call centers, vendors, drivers, catering, and third party marketing agencies. c) The section of this policy that addresses the use of guide dogs, service animals and service dogs only applies to the provision of goods and services that take place at premises owned and operated by Gillons Insurance Brokers. d) This policy shall also apply to all persons who participate in the development of Gillons Insurance Brokers policies, practices and procedures governing the provision of goods and services to members of the public or third parties. 2 Definitions Assistive Device is a technical aid, communication device or other instrument that is used to maintain or improve the functional abilities of people with disabilities. Personal assistive devices are typically devices that customers bring with them such as a wheelchair, walker or a personal oxygen tank that might assist in hearing, seeing, communicating, moving, breathing, remembering and/or reading. Disability the term disability as defined by the Accessibility for Ontarians with Disabilities Act, 2005, and the Ontario Human Rights Code, refers to: any degree of physical disability, infirmity, malformation or disfigurement that is caused by bodily injury, birth defect or illness and, without limiting the generality of the foregoing, includes diabetes mellitus, epilepsy, a brain injury, any degree of paralysis, amputation, lack of physical co-ordination, blindness or visual impediment, deafness or hearing impediment, muteness or speech impediment, or physical reliance on a guide dog or other animal or on a wheelchair or other remedial appliance or device; a condition of mental impairment or a developmental disability; a learning disability, or dysfunction in one or more of the processes involved in understanding or using symbols or spoken language; a mental disorder; or an injury or disability for which benefits were claimed or received under the Insurance Brokers plan established under the Workplace Safety and Insurance Brokers Act, Guide Dog is a highly-trained working dog that has been trained at one of the facilities listed in Ontario Regulation 58 under the Blind Persons Rights Act, to provide mobility, safety and increased independence for people who are blind. Service Animal as reflected in Ontario Regulation 429/07, an animal is a service animal for a person with a disability if: it is readily apparent that the animal is used by the person for reasons relating to his or her disability; or if the person provides a letter from a physician or nurse confirming that the person requires the animal for reasons relating to the disability. 3 Service Dog as reflected in Health Protection and Promotion Act, Ontario Regulation 562 a dog other than a guide dog for the blind is a service dog if: it is readily apparent to an average person that the dog functions as a service dog for a person with a medical disability; or the person who requires the dog can provide on request a letter from a physician or nurse confirming that the person requires a service dog. Support Person as reflected in Ontario Regulation 429/07, a support person means, in relation to a person with a disability, another person who accompanies him or her in order to help with communication, mobility, personal care, medical needs or access to goods and services. 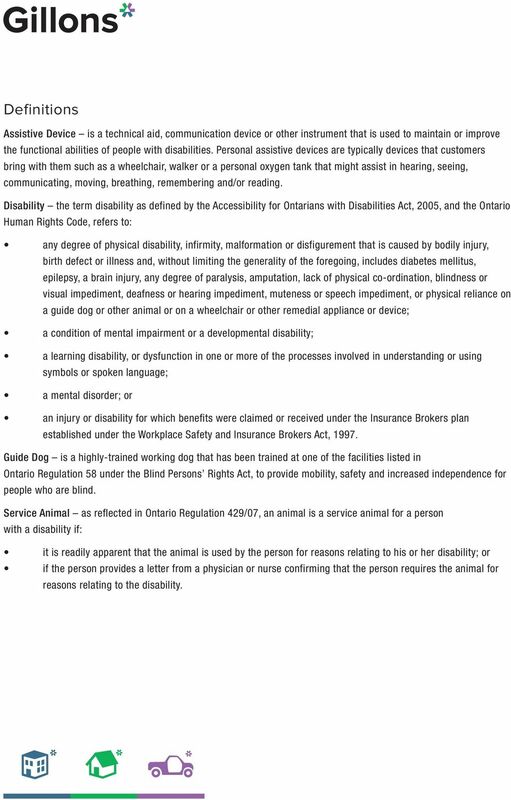 General Principles In accordance with the Accessibility Standards for Customer Service, Ontario Regulation 429/07, this policy addresses the following: A) The Provision of Goods and Services to Persons with Disabilities; B) The Use of Assistive Devices C) The Use of Guide Dogs, Service Animals and Service Dogs D) The Use of Support Persons E) Notice of Service Disruptions F) Customer Feedback G) Training H) Notice of Availability and Format of Required Documents A) The Provision of Goods and Services to Persons with Disabilities Gillons Insurance Brokers will make every reasonable effort to ensure that its policies, practices and procedures are consistent with the principles of dignity, independence, integration and equal opportunity by: ensuring that all customers receive the same value and quality; allowing customers with disabilities to do things in their own ways, at their own pace when accessing goods and services as long as this does not present a safety risk; using alternative methods when possible to ensure that customers with disabilities have access to the same services, in the same place and in a similar manner; taking into account individual needs when providing goods and services; and communicating in a manner that takes into account the customer s disability. 4 B) Assistive Devices Customer s own assistive device(s): Persons with disabilities may use their own assistive devices as required when accessing goods or services provided by Gillons Insurance Brokers. In cases where the assistive device presents a safety concern or where accessibility might be an issue, other reasonable measures will be used to ensure the access of goods and services. For example, open flames and oxygen tanks cannot be near one another. Therefore, the accommodation of a customer with an oxygen tank may involve ensuring the customer is in a location that would be considered safe for both the customer and business. Or, where elevators are not present and where an individual requires assistive devices for the purposes of mobility, service will be provided in a location that meets the needs of the customer. C) Guide Dogs, Service Animals and Service Dogs A customer with a disability that is accompanied by guide dog, service animal or service dog will be allowed access to premises that are open to the public unless otherwise excluded by law. No pet policies do not apply to guide dogs, service animals and/or service dogs. 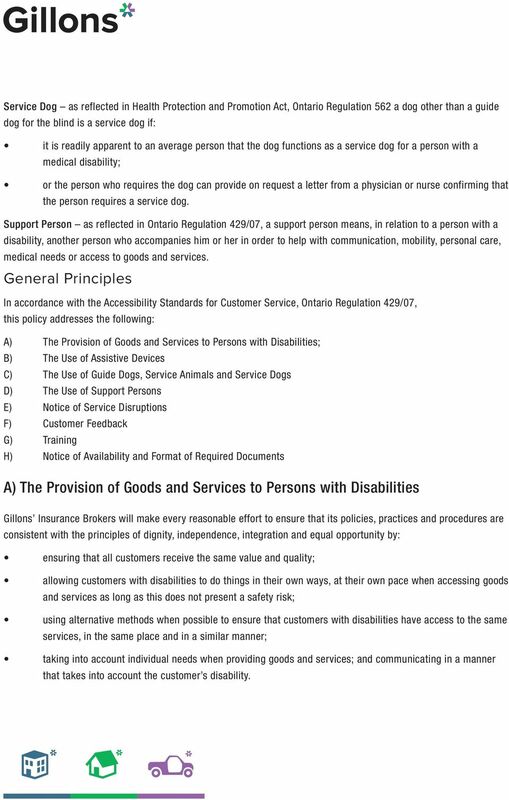 Exclusion Guidelines: If a guide dog, service animal or service dog is excluded by law (see applicable laws below) Gillons Insurance Brokers will offer alternative methods to enable the person with a disability to access goods and services, when possible (for example, securing the animal in a safe location and offering the guidance of an employee). Applicable Laws: Food Safety and Quality Act 2001, Ontario Regulation 31/05: Animals not intended for slaughter or to be euthanized are not allowed in any area or room of a meat plant. It also makes an exception for service dogs to allow them in those areas of a meat plant where food is served, sold or offered for sale to customers and in those areas that do not contain animals or animal parts and are not used for the receiving, processing, packaging, labelling, shipping, handling or storing of animals or parts of animals. The Health Protection and Promotion Act, Ontario Regulation 562 Section 60, normally does not allow animals in places where food is manufactured, prepared, processed, handled, served, displayed, stored, sold or offered for sale. It does allow guide dogs and service dogs to go into places where food is served, sold or offered for sale. However, other types of service animals are not included in this exception. 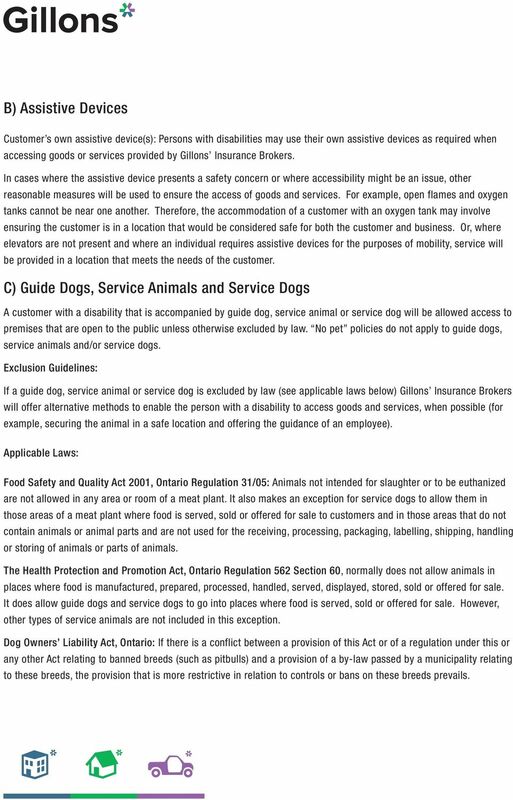 Dog Owners Liability Act, Ontario: If there is a conflict between a provision of this Act or of a regulation under this or any other Act relating to banned breeds (such as pitbulls) and a provision of a by-law passed by a municipality relating to these breeds, the provision that is more restrictive in relation to controls or bans on these breeds prevails. 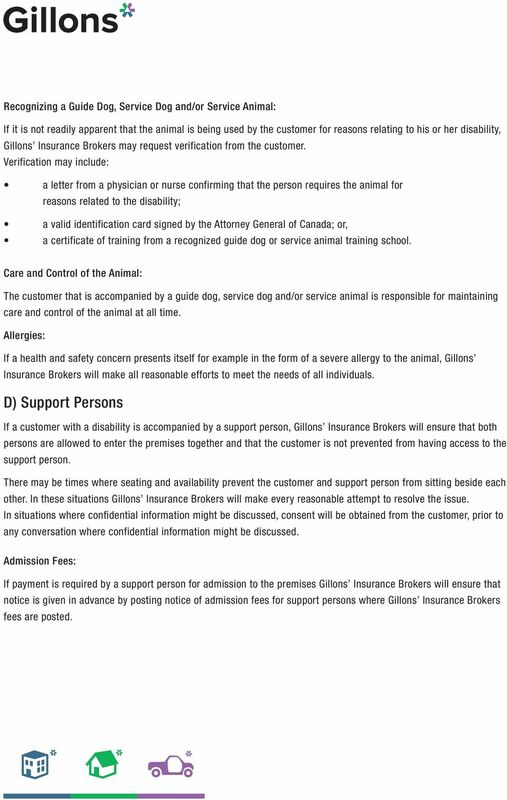 5 Recognizing a Guide Dog, Service Dog and/or Service Animal: If it is not readily apparent that the animal is being used by the customer for reasons relating to his or her disability, Gillons Insurance Brokers may request verification from the customer. Verification may include: a letter from a physician or nurse confirming that the person requires the animal for reasons related to the disability; a valid identification card signed by the Attorney General of Canada; or, a certificate of training from a recognized guide dog or service animal training school. Care and Control of the Animal: The customer that is accompanied by a guide dog, service dog and/or service animal is responsible for maintaining care and control of the animal at all time. Allergies: If a health and safety concern presents itself for example in the form of a severe allergy to the animal, Gillons Insurance Brokers will make all reasonable efforts to meet the needs of all individuals. D) Support Persons If a customer with a disability is accompanied by a support person, Gillons Insurance Brokers will ensure that both persons are allowed to enter the premises together and that the customer is not prevented from having access to the support person. There may be times where seating and availability prevent the customer and support person from sitting beside each other. In these situations Gillons Insurance Brokers will make every reasonable attempt to resolve the issue. In situations where confidential information might be discussed, consent will be obtained from the customer, prior to any conversation where confidential information might be discussed. Admission Fees: If payment is required by a support person for admission to the premises Gillons Insurance Brokers will ensure that notice is given in advance by posting notice of admission fees for support persons where Gillons Insurance Brokers fees are posted. 6 E) Notice of Disruptions in Service Service disruptions may occur due to reasons that may or may not be within the control or knowledge of Gillons Insurance Brokers. In the event of any temporary disruptions to facilities or services that customer s with disabilities rely on to access or use Gillons Insurance Brokers goods or services, reasonable efforts will be made to provide advance notice. In some circumstances such as in the situation of unplanned temporary disruptions, advance notice may not be possible. Notifications will include: In the event that a notification needs to be posted the following information will be included unless it is not readily available or known: goods or services that are disrupted or unavailable reason for the disruption anticipated duration a description of alternative services or options Notifications Options: When disruptions occur Gillons Insurance Brokers will provide notice by: posting notices in conspicuous places including at the point of disruption, at the main entrance and the nearest accessible entrance to the service disruption and/or on the Gillons Insurance Brokers website; contacting customers with appointments; verbally notifying customers when they are making a reservation or appointment; or by any other method that may be reasonable under the circumstances. 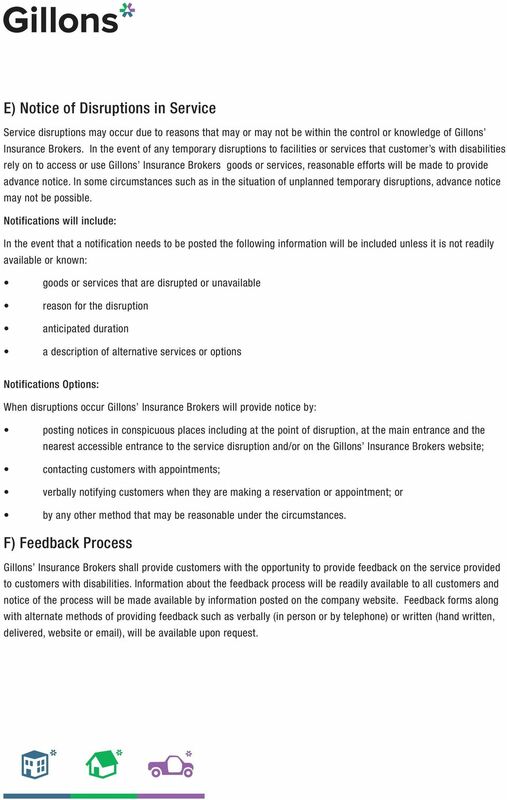 F) Feedback Process Gillons Insurance Brokers shall provide customers with the opportunity to provide feedback on the service provided to customers with disabilities. Information about the feedback process will be readily available to all customers and notice of the process will be made available by information posted on the company website. Feedback forms along with alternate methods of providing feedback such as verbally (in person or by telephone) or written (hand written, delivered, website or ), will be available upon request. 7 Submitting Feedback: Customers can submit feedback to: Grace Cridland, CAIB VP Administration and Finance Ext Church Street, Fort Frances, Ontario P9A 1E5 Customers who wish to provide feedback by completing an onsite customer feedback form or verbally can do so to any Gillons Insurance Brokers employee. Customers that provide formal feedback will receive acknowledgement of their feedback, along with any resulting actions based on concerns or complaints that were submitted. G) Training Training will be provided to: a) all employees, volunteers, agents and/or contractors who deal with the public or other third parties that act on behalf of Gillons Insurance Brokers. b) those who are involved in the development and approval of customer service policies, practices and procedure. 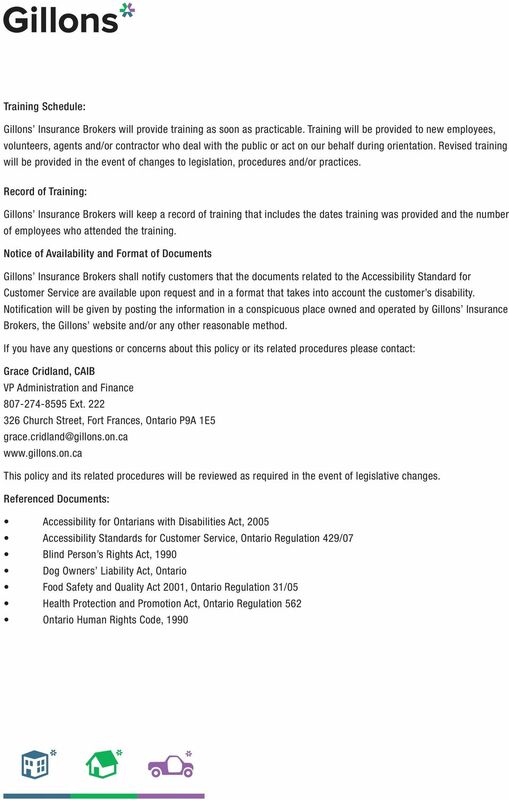 Training Provisions: As reflected in Ontario Regulation 429/07, regardless of the format, training will cover the following: A review of the purpose of the Accessibility for Ontarians with Disabilities Act, A review of the requirements of the Accessibility Standards for Customer Service, Ontario Regulation 429/07. Instructions on how to interact and communicate with people with various types of disabilities. Instructions on how to interact with people with disabilities who: use assistive devices; require the assistance of a guide dog, service dog or other service animal; or require the use of a support person (including the handling of admission fees). Instructions on how to use equipment or devices that are available at our premises or that we provide that may help people with disabilities. Instructions on what to do if a person with a disability is having difficulty accessing your services. 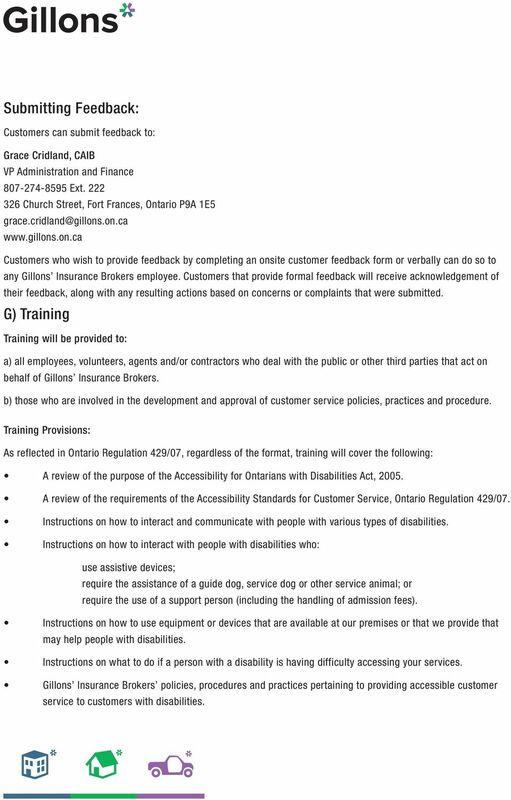 Gillons Insurance Brokers policies, procedures and practices pertaining to providing accessible customer service to customers with disabilities.